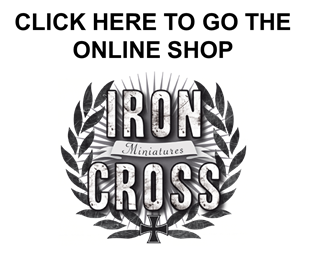 Welcome to the Iron Cross Miniatures online shop. In the Shop section you will find everything to raise a late-war Waffen-SS infantry force. The models are also suited for Wehrmacht Panzergrenadiers. We present to you finely sculpted, well researched 28mm miniatures cast in white metal. The numerous myths about the Waffen-SS have long been refuted. They were not merely elite soldiers and they not just found motivation in defending their homeland. Ethos, training and their actions in the field were all expressed their deep indoctrination and extreme ideology. They were the apex of a murderous war against individuals deemed unwanted or enemy by Nazi ideology. And they committed innumerable crimes against civilians, Jews and POWs – especially in eastern Europe and the Soviet Union. So why cast them, paint them and play with those miniatures? We believe, that historical wargaming cannot merely be about the colour of flags, types of shakos or the discussions about the “best tank”. We approach historical wargaming by learning about the historical timeframe as a whole: The fighting men of every age and nation disclose a lot about the societies that bore them. All soldiers are infused with the values and ideologies of their community. So it is important not to merely ask how they fought, but also why they fought. Leaving the Waffen-SS out of the picture would be keeping quiet about a great evil and a big factor to understanding the catastrophe of National Socialism. It would be a distortion of history. Therefore: We ask you to paint them, to play them and learn about why they were there.